I began sorting through drawer loads of recipes collected since the early sixties. I’ve dragged them around more twenty- six homes and three countries, and frequently can’t find the one I want; and though I try to keep my favourites altogether, they still stray into other collections of ‘intending to try’, and ‘must try’. After hours spent sorting them into piles, and several rubbish bags filled with the unwanted trimmings of yellowing newsprint and magazine borders, I realised that this truly was what is called a back-breaking job. I hadn’t even handled a quarter of the clippings. Method: sort through the whole lot, putting them into cake, pudding, pasta, rice, chicken, fish piles, soups, salads, suppers, savouries, sauces and so on. Then sort the piles, throw out the duplicates, and trim yet again, to fit into scrapbooks, and stick them in. The cake book was huge, almond, fruit, lemon, plum, rhubarb, apple, madeira, chocolate, coffee, the whole nine yards. It has taken me days to get this far. The interesting thing is that I recognise most of the recipes, know where we were living then, and even remember with many of them, how and when I tore or cut them out, right back to 1964, when we were living in a country house called Newney Hall in the hidden country-side of Essex. I can remember many of the dinner parties and the people who were there and the menus. Crocenbouche in the height of a Hongkong summer, with no air-conditioning in the kitchen, dripping with sweat, as I baked choux pastry balls, whipped up cream with cointreau, and made the caramel to dribble over the pyramid of puff pastry balls. Biskotten torte, a Danish coffee and walnut confection which could be made a week beforehand, given to me when I was engaged, by my stepmother’s best friend, staying with them in Shrewsbury; vol-au-vent, one of my father’s favourites, and mint and orange salad, a Robert Carrier special from the then new Sunday Times colour supplement. Then there were the handwritten ones, salmon slice from Jenny, fruit cake from some people who read my columns, and who delivered a cake personally – then a recipe which the children still hanker after – a vegetarian meat loaf, made principally from pea-nuts, garlic, carrots and herbs, this sent by a reader in Tauranga, after a column on vegetarianism – Marianne’s beetroot relish, Frances’s apple cake, Evelyn’s strawberry jam. So the whole exercise raked over old memories, stretching back for fifty years. Many of the favourites had greasy or jammy finger-marks all over them, splotches of grease, or wine-stains! I now have three thick scrapbooks catalogued into easily discovered sections, and decorated with beautiful pictures of food, fruit or vegetables cut out from magazines, and when I need a new idea for a meal, I go to leaf through them, and find something to inspire me. In another day and age, I would have bequeathed them to my daughter, and they would have become family heirlooms like the treasured notebooks in browning spidery hand-writing of previous generations. But alas, already, even I now go to the internet for a quick fix on how to cook asparagus in the micro wave, and when I asked my daughter for a recipe for hot cheese scones we’d had for lunch, she sent me the internet reference. I have shelves of cookbooks I used to love reading, but which I rarely ever open these days… apart from Elizabeth Luard’s book on family life which includes a number of my favourite recipes, and I can’t cut them out and ruin the book, so there they stay. So it seems to me that my recipe scrapbooks are as obsolete as the family photograph albums. As with cookbooks, I have a shelf groaning with photograph albums. Not many from my early years, I have to admit – not much photographing went on in our family during the war, with my father overseas for seven years at the war, and my mother gone. But some from schooldays as a teenager, a precious few of previous generations – when taking a photo was serious stuff – and dozens and dozens of pictures of my children and grand- children. They and I used to pore over them when they were little, and reminisce about their childhoods. Maybe one day they would have been interested, not just in the records of their childhoods, but in the older family photos too, the records as it were, of their ancestors. But it’s been many years since I received any up to date physical photos of my family to insert into an album. Lots yes, on the internet, but will they still be there in twenty years? Will this generation and succeeding ones have any of the family records that we, and previous generations have had since the camera was invented by Frenchman Louis Daguerre in1838 and Englishman William Fox- Talbot in 1839? Even before then, portraits, miniatures, sketches, silhouettes provided some family records. But today, we seem to have lost something precious, something perhaps that we only appreciate as we get older. Young people are too busy taking their selfies, and posting on Facebook and all the other social media outlets to realise that the impermanence of this new technology has its drawbacks. Then, I think to myself, is it just me that sees it this way? And then another inner voice stoutly proclaims that honouring the past, recognising the lives and achievements of our ancestors matters; knowing where we come from gives us a standard to live by, a knowledge that our forbears have faced and overcome great challenges in their lives, and therefore, so can we. Even the trivial recognitions as we peer at good-looking Great-Aunt Jessie and recognise our nose, our eyes, and realise that we are part of a long chain of lives and family, gives us a sense of rootedness, and a feeling of permanence. Seeing faded pictures of poor Great – Uncle Arthur and remembering that he died on HMS Vanguard which un-explainedly exploded in Scapa Flow in 1917 taking him and another 799 sailors to the bottom, puts us in touch with history; learning about valiant Great-Aunt Violet who overcame childhood polio, lived with painful irons on her legs all her life with no complaint, and brought up a happy family, can inspire us to believe that we too have profound inner strengths with which to face the challenges of our own lives. So yes, in some ways, as I look at my proud achievement of those gathered recipes into thick scrapbooks, I feel sad, as they symbolize so many other facets of life absent in this brave new world of convenience and technology. And yes, I know too, that there is no turning back, so that like my ancestors I must make the best of it, suspecting that my descendants have no idea of what they might have lost! Ovid wrote this sometime before the birth of Christ… he also wrote that everything changes and nothing perishes – his words are my conundrum, my lesson and my answer. My daughter gave me delicious hot cheese and bacon scones when I dropped in at lunch time. “Only three ingredients,” she boasted, “apart from the bacon which I added”. I couldn’t wait to try them myself! Annabel Langbein, a NZ cookery writer invented them: two and a half cups of SR flour, two and a half cups of grated cheddar cheese, and two cups of Greek yogurt, plus salt and pepper. Mix them all together, drop spoon-fuls onto a greased tray, and cook in a moderate oven for ten to fifteen minutes. Mine took a bit longer than the stated time to cook because I simply put the whole lot on the tray in one piece and cut it into triangular segments. But they were good. Next time I’ll add some chopped cooked bacon, and might add some Parmesan too. The more faithfully you listen to the voice within you, the better you will hear what is happening outside. And only she who listens can speak. Dag Hammarskjold Swedish Secretary-General of the UN for eight years. He died in a mysterious plane crash in Africa in 1961 at the age of forty-seven, and JFK described him as one of the greatest statesmen of our time. 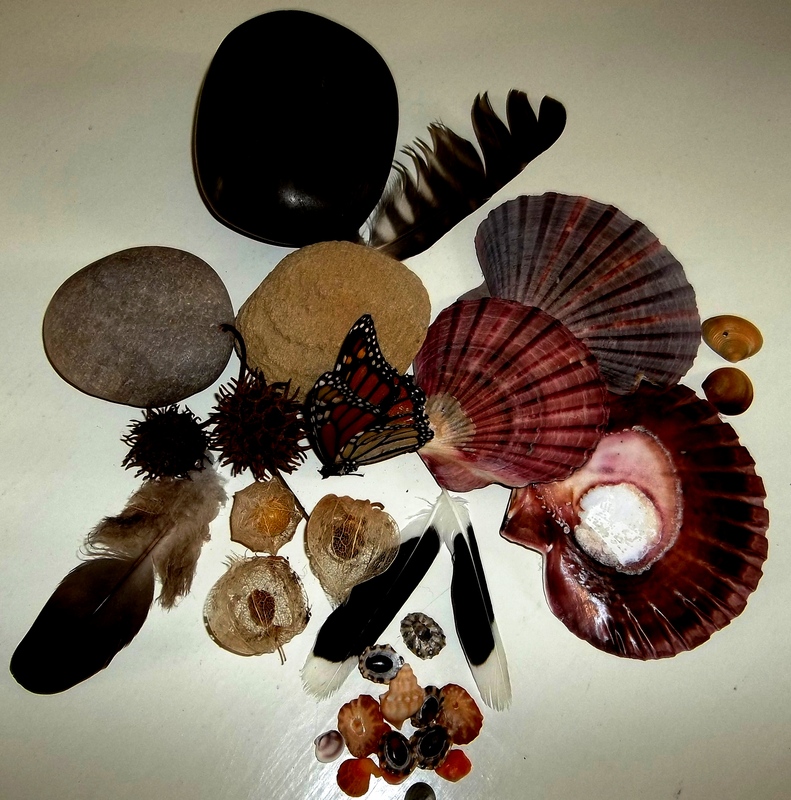 These stones and feathers and shells can tell the story of my life in the last few decades… shells collected with the children on a Northland beach, a black and white feather lying outside the door when I opened it on our first day in a new house – greeting from a tui… the brown and cream morepork feather found on a long walk around the harbour with the thoughts and dreams of that afternoon threaded through its fronds. An ancient stone from a river bed in the Blue Mountains of Australia was picked up after a day spent abseiling in abject terror, another from a cold pebbled beach in Devon, the chill of the Atlantic breakers still embedded in it after all these years, while the polished brown stone came from an underground cave in the central North Island where glow-worms illuminated the roof, and a river flowed through. These things are the stuff of my life… as they are of every life in which they are valued. As I looked at them I thought of how other collections can also tell the story of a life. When I renewed my passport recently I found all my old ones, going back to when I was twelve and going to France on my own to learn French. In that passport photo two frightened brown eyes gazed out at the world. I had been so appalled at this picture that I promptly destroyed the evidence. Which left the rest – a twenty one year old about to go on holiday to Spain, well- groomed hair, immaculate lipstick, and veiled blank eyes… the next, an exhausted mother of two toddlers about to go to Hong Kong, badly cut hair, eyes sad and resigned. And then, a picture of a thirty five year old woman, lots of dark hair piled up confidently, smiling eyes, relaxed smile. Life to be lived now, not endured. In the decades since, the hair has got shorter and then faded, and the last photo was so awful I hoped to be un-recognisable, but the story of a life is told in those passport photos. Another can tell the story of their life in their jewellery, the coral necklace given at a christening, the charm bracelet for a little girl, pearls for a twenty-first, the engagement ring and the gold band… a gift to mark the first child, a clumsy pottery brooch made at school and proudly presented to a beloved mother… the ring inherited from a grandmother, the eternity ring at a silver wedding… such precious collections can mark out the steps of a life quite as well as a photograph album. I wonder if there is even a market these days for photograph albums now all our photos are taken on phones and I-pads. I was never much of a photographer, so that the photos of my honeymoon were on the same roll of film as the pictures of my first baby. But I did have a memory. I remember one summer’s afternoon when the children were three and four as they tumbled around on the grass, one wearing a sun-suit in glorious colours of pink and orange and red, the other in matching shirt and orange shorts. As I looked at them, revelling in their laughter, their shining hair, and sparkling eyes, pearly teeth and glowing sun-tanned faces, I thought to myself, I’m going to remember this moment forever. It was a turning point, because I found I did never forget that moment. So now, I know I can fasten those moments I want to remember with that little intention, and our minds are so obedient that they obey the instructions, and can call up the images whenever they are wanted. On the other hand, I wonder if the ease of communication, the instant photos, the selfies sent from Rome or Khatmandu which reach every member of the family all over the world the same day, make it easy to forget. We don’t have to remember, because it’s all there, on Facebook or in the picture file on the computer. But for how long? Until the internet crashes? Or some other disaster hits the net? The computer is stolen? Few people will be able to pick up old albums in the future and leaf through them re-living their own lives, or discover the lives of their ancestors. And how will biographers fare in the future? In the past we’ve had portraits and miniatures in pre-photography days; then the wonderful stilted posed photos of the early days of photography, with the expert’s head hidden under a black cloth over a tripod while he captured forever the people and that moment in their time. Then came the brownie box camera and all the other simple do- it- yourself cameras, and families recorded their events and special moments themselves. Biographies of the famous from the twenties until the sixties are full of revealing snaps, but what will there be for future writers and historians wanting to illustrate their books about the powerful and famous? Not much, I suspect. In the past, many anonymous photos turned out to be records of history – impromptu black and white snaps of Battle of Britain pilots ‘scrambling’, shots of families crouched in air –raid shelters from London to Leningrad, soldiers in Africa or Italy taking grainy pictures of each other to send back home… joyful hugs and kisses of victory – all these spontaneous pictures of humanity enduring both the ordeals and the pleasures of the twentieth century, captured in black and white film, are the stuff of history. But I wonder what history is being preserved today in our somewhat ephemeral records? Will collections of jewellery or stones, in the end be the things to jog people’s memories in the future? Maybe the photos in passports and on driving licenses will the best concrete records we will have… time to get a decent picture taken for these official documents perhaps ! Summer salads don’t always mean lettuce for me… One of my favourites is grated cauliflower, mixed with chopped hard- boiled egg, some chopped Medjuel dates, toasted slivered almonds, and lots of chopped parsley. Then stir in enough good mayonnaise to the consistency you like. Chopped apple or banana is a variation, but actually anything can be added, and it still tastes good. But it can’t sit around, or it turns watery. I eat it on its own, but it’s also good with cold chicken. And a poet said, Speak to us of Beauty. And he answered: Where shall you seek beauty, and how shall you find her unless she herself be your way and your guide? Beauty is not a need but an ecstasy. It is… a heart inflamed and a soul enchanted … a garden forever in bloom and a flock of angels in flight. ‘The Prophet’ by Kahlil Gibran, Lebanese poet, 1883 -1931. ‘The Prophet’ has never been out of print since it was published in 1923.